Eighty students and teachers attended my Gringolandia presentation at the Center for Fiction. Photo: Nicolette Fudge. In a sense, Gringolandia was my first effort at translation. The Chileans I spoke to (mostly in Spanish) believed I had a special ability to create a story that would touch the hearts of people in the United States whose government played a key role in the September 11, 1973 military coup that toppled the democratically elected socialist government of Salvador Allende and ushered in 17 years of tyranny in the name of capitalist free markets. It took me another 19 years to get the translation right, to write a novel that succeeded as fiction as well as history, in the words of one review, “that touches the heart and opens the mind.” I also had to find a publisher willing to consider a young adult historical novel set in a faraway country long out of the news cycle, a publisher driven by a mission — in this case, Curbstone Press, a literary nonprofit long dedicated to publishing fiction, poetry, and memoir on intercultural understanding and human rights — rather than a corporation interested only in the bottom line. Signing books for students from the Academy of Young Writers. Photo: Nicolette Fudge. With the students, I talked about the Cold War and how, when we opposed the tyranny of Communism, we often subjected people to the equally brutal tyranny of right-wing anti-Communism — fascism and its offshoots. They appreciated how I dealt with subjects of oppression, incarceration, and youth activism. The teachers, too, appreciated a novel that could tie into the social studies as well as the language arts curriculum. I discussed the role of historical fiction as a way of presenting the stories of ordinary people, as opposed to the elites who dominate the accounts in textbooks. It’s important for young people to know that change doesn’t only occur — or occur most of the time — from the decisions of the wealthy and powerful. Ordinary people rising up and speaking out have brought about most of the changes that have improved our lives, from civil rights to women’s suffrage, from workers’ protections and the end of child labor to marriage equality and other rights for LGBTQ+ individuals. I cited the work of Howard Zinn, his People’s History of the United States, as my inspiration for portraying the stories of ordinary people when before, as a graduate student in history, I only wanted to write nonfiction — only the facts. I promised the teachers a link to the ongoing work of the Zinn Education Project, which seeks to explore and teach the history of ordinary people through literature and hands-on projects. Presenting Three Balls of Wool at Kidlitcon. Photo: Cheryl Dishon. 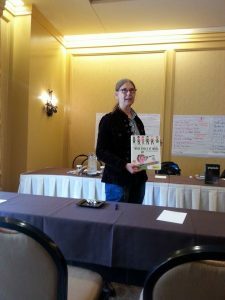 Four days later I presented to teachers, librarians, and other writers at Kidlitcon, which was held this year in Hershey, Pennsylvania. 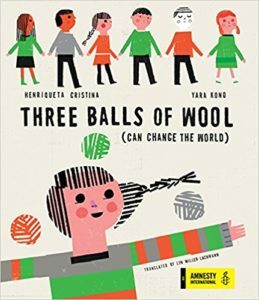 There, I focused on the refugee experience, as portrayed in Three Balls of Wool and Gringolandia. We talked about age appropriateness and the importance of giving young readers a sense of agency and hope. Three Balls of Wool does exactly that. When the Portuguese family, fleeing a right-wing dictatorship, fails to find the freedom they sought in Eastern Europe, the young girl and her mother set about making changes on their own. In fact, home-based weavers and tailors worked mightily to counteract the drabness of Communist dictatorships that saw all their people as identical and interchangeable cogs in a machine. Last night at a PEN Children’s Committee meeting, the 16 writers in attendance discussed the question of “what to tell the children” about the challenges of living under the current government in the United States, especially children facing deportation, nationalist discrimination and violence, or attacks for being queer and/or disabled. What would empower children rather than discourage them? 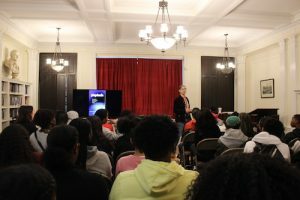 I spoke about the power in the statement, “you are not alone.” The fact that we are neither the first nor the only people to face oppression means that we have real-life models for surviving and overcoming our current situation. Historical fiction is full of those models, ordinary people who struggled, reclaimed their dignity, and, by working together, brought about positive change. Hola Lyn, realmente la ficción histórica de las novelas, dejan una gran enseñanza, y creo que has sido pionera en escribir estos relatos. Estados Unidos, está llena de estas historias, personas que han huido de sus países no porque quieran hacerlo, sino por las circunstancias que nos ha tocado vivir, padecer y hasta morir. Gringolandia hoy más que nunca cobra revuelo, felicidades por tus presentaciones y la cálida acogida que ha tenido. Muchas gracias, Jany! De veras, los refugiados y la mayoría de los inmigrantes económicos no quieren salir de sus hogares, sus familias, y sus comunidades. Los del EEUU (y otros paises con ex-imperios como Gran Britania y Francia) deben entender que la política de sus gobiernos han hecho refugiados y inmigrantes, un problema que va a empeorar con el asalto contra el ambiente y el clima. Howard Zinn was a historian who focused on history from the grassroots rather than from the perspectives and actions of the elites. His work revolutionized the way a lot of people look at and teach history, myself among them. I’ve very glad to be introduced to Zinn’s Education Project. I had read about him, but not known what a fabulous resource he is. Thank you for that, Lyn! It’s great to read your approach. You are doing wonderful and important work in helping young people to see beyond the proscribed texts and the propaganda of their age. Thank you, Amanda! I appreciate both September 17 and The Pact and look forward to your next historical novel. Yay, Lyn! So glad you had some great opportunities to talk about your work! I love that you were able to speak to young writers about the power of the written word. Thank you, Linda! A bit advantage of historical fiction is that it never becomes dated, and Gringolandia is as relevant now (if not more so) as when it came out eight years ago.